Who is Alfie? He was a baby in England that has garnered international news because the doctors refuse to treat him removing his oxygen and allowing him to starve to death. The hospital and doctors that treated him say that Alfie suffered from a degenerative neurological condition that is fatal, that he is in a semi-vegetative state and his medical care is not justified. His parents, supported by the Italian and Polish governments and the Pope, wanted his care to continue. How did we get to this point? The culture of life vs. the culture of death. Private care vs. socialized care. Thomas Evans & Kate James, parents of baby Alfie Evans, vs. the Alder Day hospital in Liverpool England and socialized medical care. Parents making decisions to care for their children vs. the state taking control and deciding who lives and who dies. The state government refusing to allow the parents of Alfie to take their child to another country for care. Disregarding faith and spiritual aspects for loving and caring for Alfie. Loving all life in all forms vs. devaluing life so quickly. The state of England allowed Alfie to die. He did not reach the age of two. The state took control displacing parental rights. Is this the future of all western democracies? State governments choosing who lives and who dies? There is much to reflect on in Alfie’s premature state directed death. There are many questions we should reflect on. I’ll begin with this reflection; the more power we acquiesce to state authorities, the less control we have on our own lives and those we love. The Glenn Beck Show & The Catholic Channel on Sirius XM have been doing an admirable job of covering this sad chapter in human history. A once proud nation, it appears that England is in its death throes as it allows the further debasement of its citizens by demanding the death of its own most innocent……the children that become sick that would cost too much to care for under its own form of governmental “health care”? Are you kidding me? Wake up America! The death panels that Obama said did not exist in his program, do exist in England. It’s only by God’s intercession that we were given a second chance to kill this evil in our own country with the election of a President who has become a champion for life. We should pray for the people of England that they are able to change this culture of death. 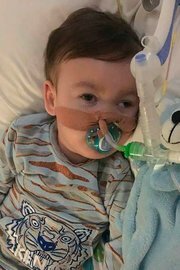 We should pray for Alfie and his parents that they may receive the miracle of healing and life from the Almighty that they seek for their son. May God forgive us for the evil that we do and that we allow.